Before starting a laser hair removal treatment, our practitionner needs to infor you about the contraindications. In the majority of cases, you should avoid the use of lasers on these skin conditions as it is one of the most important laser hair removal contraindications. Lasers use cooling devises and we therefore do not recommend to use them on patients with urticaria. You should not receive a laser treatment in the majority of cases. For trauma and firearm burns, the presence of powder under the skin can react violently when exposed to a laser. The pigment around the tattoo absorbs the light and releases it as high thermal energy causes burning. The proximity of the hair to the tattoo is critical. However, at Epilium & Skin we use a specific procedure and are able to treat areas that are relatively close to a tattoo. If a vein becomes hard, yellowish and painful, it is probably a superficial phlebitis. This condition is harmless but you should see your GP to discuss it further. These hard veins can lead to complications (severe embolism). 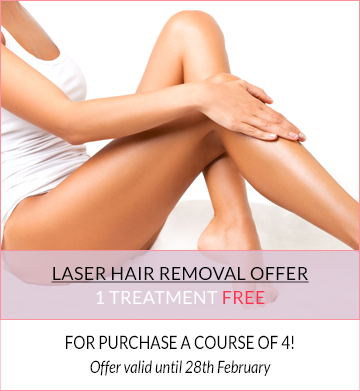 Because you can’t use laser hair removal in these areas, we will propose you an alternative procedure. With certain temporary contra-indications, we consider laser hair removal as not possible. We don’t allow the use of lasers during pregnancy and beast feeding (although to date no one has ever oserved malformation). However, we recommend waxing treatment to remove unwanted hair during pregnancy. (Antibiotics such as quinolones or cyclines derivatives) and hormonal medications. Patients should wait until completing their course of medication before considering laser hair removal. Remember to report any medication before starting a laser session; We can adapt or delay the treatment to ensure your health and safety. Recent exposure to the sun or high density ultraviolet light (tanning booths), the use of self-tanning lotions or tanning enhancers (Sun Supplement) means that you should delay any laser treatment. Recent tanning can lead to skin burns as it diverts a portion of the laser light energy to the enhanced melanin in the skin. A diet rich in vitamin A or carotene is contra-indicated for laser hair removal. These supplements cause photosensitivity of the skin and increase the risks and side effects of laser treatments. It is important to stop using dietary supplements at least 2 months before any permanent hair removal treatment, and you must advise your Epilium & Skin consultant accordingly. Treatment with a retinoid such as Roaccutane cause changes in the skin’s ability to heal and there is a significant laser hair removal contraindications. Treatments with certain anti-acne medication (especially Roaccutane®) are therefore contra-indicated for laser hair removal. You need to wait for six months after the end of the medication before starting your session. These drugs can cause side effects when mixed with laser treatment. Using a laser can cause small haemorrhages in skin tissue. It is therefore imperative that you advise your Epilium & Skin team when you take anticoagulant medication. The laser light must bypass moles since there is a risk of degeneration. The presence of some well-defined moles is not a contra-indication for laser hair removal, but the presence of several of them in the treated area is a ‘no-go’ for the consultant and your Epilium & Skin team. Should herpes have been evident on previously laser treated areas, it should have disappeared before further laser treatment. Patients with apparent cold sore symptoms (herpes simplex) must have been prescribed and used a preventative treatment before considering laser hair removal. In order to avoid any aesthetic risk or causing trauma to the infected area, a laser treatment cannot be considered until complete healing has been achieved. Allergic reactions such as bullous dermatoses, urticaria or recent allergic reactions are a temporary contra-indication because the skin is damaged or needs to regenerate. This recovery would be impeded by a laser treatment.